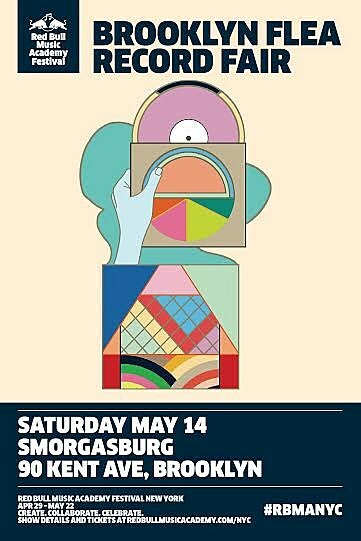 The Brooklyn Flea Record Fair is coming up Saturday, May 14 at Smorgasburg in Williamsburg with booths from indie record labels, record stores and used vinyl dealers. As in previous years, there are DJs all day long and this year the Red Bull Music Academy, which is presenting the Record Fair, has invited seven different label founders to spin tracks exclusively from their own label. Labels include Ghostly International, UNO NY, Sacred Bones, Minimal Wave, Mixpak, Styles Upon Styles, and Luaka Bop. If you can’t be there in person, all sets will also be streamed on RBMA radio. A full list of this year’s Brooklyn Flea Record Fair vendors is here. More details about the DJs, below.